For business, for industry, for governments, CNA develops customized training options from a list of over 100 full-time diploma and certificate programs. We also build entirely new programs tailored to fit the training requirements of our clients. CNA prides itself in responsiveness to your needs; training can vary in duration – from a one-day session to programs of several weeks – offered anytime, anywhere. A team of business development officers will meet with you to determine your training requirements and then work with content experts and other resource personnel to tailor a training program to meet those needs. Our services are distributed throughout the province at 17 campuses and our international campus in Qatar. Customized training is designed to meet the needs of any business or organization. Training solutions are available for individuals, corporations, government, or networks of companies with similar training requirements. We pride ourselves on being responsive to clients’ needs. Business Development Officers located strategically throughout the province provide access to experts for the development of training to meet those needs. The expertise of our professional instructional and support staff enables us to offer relevant, just-in-time training for your business. 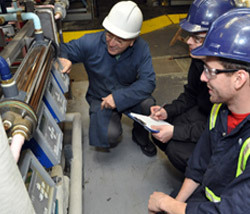 We develop and customize both long-term and short-term training and applied research options for all industry sectors. A contract program is defined as any program offered that is not part of our regularly-funded full-time programming (Grant in Aid programming). A contract program duration may be anywhere from 2 weeks up to one year and participants are usually funded by sponsoring agencies. Contract Training may offer contracted programs customized from our full-time programs or we can develop new customized training options to address the specific needs of industry, not-for-profit organizations and members of our community. Alternatively, interested organizations may select a customized program from an extensive list of more than 100 programs and over 300 courses available throughout the province. Contract programs may be developed based on an identified need for a group of organizations, community groups or individuals. Access the links below for more information on our regularly offered contract programs. NOTE: For more information about our corporate training programs, please email corporatetraining@cna.nl.ca. Supervisory and Leadership Development Modules (can be customized to your workplace needs, over 60 modules to choose from) – recognized throughout the world through our partnership with AMA International.